Bruno Bosteels. The Actuality of Communism. London: Verso, 2014. 296 pp. $16.95, paperback. Stevphen Shukaitis. The Composition of Movements to Come: Aesthetics & Cultural Labor After the Avant-Garde. London: Rowman & Littlefield International, 2015. 208 pp. $120, hardback. $39.95, paperback. Jeremy Corbyn’s landslide victory in Britain, Pablo Iglesias’s appeal in Spain, Syriza in Greece, Rafael Correa in Ecuador, Evo Morales in Bolivia, socialist Bernie Sanders in the USA and even the environmental and social justice encyclicals of Pope Francis indicate that a Leftward political shift is expanding across the globe in spite of, or perhaps because of, the near-total hegemony of turbo-charged, laissez-faire capitalism. Eight years after the start of the banking crisis that has devastated so many national economies, the prospects for a return to anything resembling social stability, let alone full-employment, appear slim to non-existent as low wages, high debt, desperate refugees, and a general state of precariousness pervades most sectors of life. The response to capital’s recurring and systemic failures in fact moves in opposite directions, including a tilt towards socialist solutions, and a contemporaneous rise in xenophobic and racist policies. But either way, the common motivator is capital’s failed promise to provide hope and security to more than just the .01%. Sanders’ campaign is perhaps the most startling sign of this shift. For even a mildly anti-capitalist message to take root in the country that brought the world Joseph McCarthy, Richard Nixon, Ronald Reagan and the Dulles brothers has to be read in large part as generational forgetting. This would not be the first time Americans have embraced socialist ideas and then forgotten they had done so. Union leader Eugene Debs was once a well-known political actor in the decades prior to the last great depression, even if today Debs’ industrial-era socialism seems to belong to a past all but abandoned by technological developments that have helped transform the very constitution of the working class, along with the means of capitalist production, into something qualitatively different and unfamiliar. For example, networked social activism is everywhere, and yet it remains severed from the type of cohesive radical politics and dissident subjectivities characteristic in past crisis decades. Perhaps today the question is really this: can socialism rescue capitalism? Because 21st Century post-industrial and post-Cold War socialism is shaping up to offer not so much a break with capitalist economics but a modifying force, loosening the constraints of austerity, while seeking a return to the welfare state model that previously fostered the emergence of the post-war middle classes whose subsequent antipathy towards unions and socialism ironically played a key role in their own economic decline. There is something politically vexing about this cycle of reaction and historical amnesia in which the latest capitalist disaster leads to a revitalizing radical spirit, that eventually propels a parliamentary shift, which in turn generates some modicum of economic reform, only to be normalized and forgotten again. Because as welcome as the current Leftward drift is after decades of unbridled capitalist debauchery, the process kind of resembles a cartoonish Rube Goldberg contraption whose ultimate function it could be argued, is to evade the declaration of one word above all: communism. 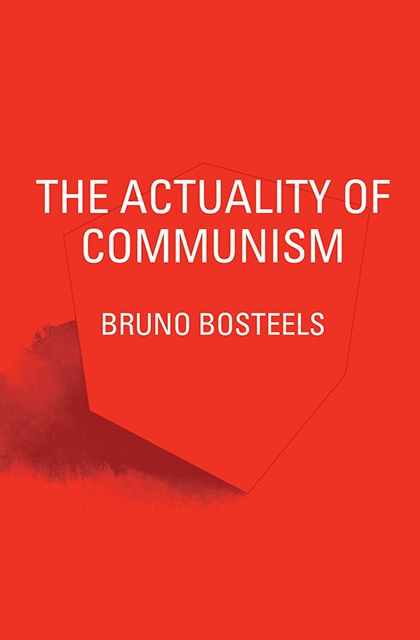 “We could even call 'communism,'" writes Bruno Bosteels in the introduction to his book The Actuality of Communism, “the ensemble of struggles, desires, and impulses that aim to exceed the parliamentary Left with its predictable oscillation between enthusiasm and betrayal,” (p. 22). Best known for a series of politically and intellectually bracing collaborations with European Leftist philosophers, Bosteels asks what it might mean for someone to be a young communist today, given that she would inevitably be trapped somewhere between the legacy of a movement deeply scarred by failure and its own disgraced legacy of human rights violations on one hand, and an equally powerful need to reinvent and revitalize the potential of this one dark phantom that still manages to haunt the sovereign corridors of capital’s citadels (p. 18). Laying out his analysis in three broad strokes over six chapters, the author interrogates the possibility of a reinvented communist theorem. In part one he addresses the “ontological turn,” seeking to untangle recent efforts at reconciling Heidegger and Marx and doing so with a sustained tone of self- criticism. One sobering verdict Bosteels arrives at is that the fundamental rejection of human essentialism once claimed to be the status quo’s greatest menace has come to merely define our present ontological status. “Difference, multiplicity, or the primacy of events and becomings over subjects and objects, far from giving critical leverage, would thus define our given state of affairs under late capitalism and its attendant cultural logic.” (62) This act of speaking bitterness then takes aim at two opposite tendencies: over-historicization and the desire to wipe-clean any historical or doctrinal specificity in order to arrive at “tabula rasa” of pure communist radicality. To the first impulse he cautions that History is too often used in this era of ever-shifting realities as an empty signifier for something both vaguely eternal and un-reproachable. It as if “History” is too big to fail, and therefore also too big to critique with any granular detail. But Bosteels also challenges the a-historicism of so-called “speculative leftism”. Mustering relevant criticism by Jacques Rancière, Slavoj Žižek, and Alain Badiou, among others, he takes us on a breakneck overview of what is wrong with this urge to forget and start afresh, though he does not dismiss this impulse altogether. The urge to unconditionally reimagine a new, untimely communist ontology may hold out he suggests “an important tactical and even strategic efficacy today” (p. 271). In the final chapters, Bosteels brings us around to his primary claim involving the already-present actuality of communism within capitalism; that is to say, the presence of that unruly ensemble of dissident impulses, typically located at the social margins, but which nonetheless constitute a force capital both unleashes, and also constantly struggles with. For the author, the question of whether or not that which surpasses and outstrips both capitalism and socialism should do so in the name of communism (or Marxism for that matter) seems to turn on the ability to sustain a dialectical tension between a speculative “enabling fiction” (p. 264), one that equips emancipatory politics with an ontological imaginary necessary to do battle in the actual world, while not altogether forgetting the thoroughly historicized, post-foundational subject that both Marxism and Deconstruction have left in their wake (p. 43). It is a process akin to Nietzsche’s active forgetting: the capacity to enact an openness towards the future’s unforeseen possibilities without being weighed down by history, while simultaneously remaining cognizant of history’s ghostly presence just the same. To realize this, it seems that communism would have to step out of the nebulous ether and into the actuality of present day struggles, instantiating a singular, radical event that would forever alter what followed, as well as what preceded this emergence. And one other thing is clear in this scenario: communism would no longer haunt capitalism. It would, however, continue to haunt itself. Anti-capitalist phantoms also occupy Stevphen Shukaitis’s extensively researched book The Composition of Movements to Come: Aesthetics & Cultural Labor After the Avant- Garde in which he asks if a Leftist political strategy could be based on the “wisdom of the clown, the fool and the mystic.” Invoking poet Andrei Codrescu’s image of a fictionalized chess match between Dadaist Tristan Tzara and V.I. Lenin, Shukaitis writes, “what if Tzara’s actions, in the approach of Dada, were not random non-sense, but rather a way of strategizing through collective creation and artistic activity?” (p. xi) Counter- intuitively, his answer pivots on understanding art’s alleged purposeful purposelessness not as the antithesis of capitalist logic, but as fully integrated into the latter’s pursuit of surplus value. At first this assertion appears to contradict the author’s stated desire to construct a political strategy out of avant-garde aesthetic practices. However, like Bosteels, Shukaitis grasps the immanent negation generated by capital’s world-melting agency, even if for Shukaitis, unlike Bosteels, that dialectical other is distinctly tied to labor, rather than communism per se. “Historically the art world, and the work of art itself, has provided a laboratory for developing new forms of capital accumulation, the intensification of labor, and precisely because of that, as a space for rethinking methods and tactics for sabotaging and disrupting those very processes of accumulation” (p. 84). To buttress this contention Shukaitis plows through the work of a multitude of theorists, including perhaps too many of the usual suspects; nonetheless, for the patient reader he ultimately assembles a tool-box of refurbished critical practices drawn primarily from three sources including the Situationist International (SI), assorted manifestations of art strikes, and the Yugoslavian artists’ collective Neue Slowenische Kunst (NSK). From the former he derives new ways to apply such well-known SI concepts as psychogeography, détournement, and derive, constantly proposing the need to overhaul the Post-War specificity of these practices so as to confront a very different enemy today. For example psychogeography was for SI a kind of research methodology for understanding the effects of specific environments on those who move within capitalist urban space. But in the work of the Madrid-based feminist collective Precarioas A la Deriva, the spatial affects of Post-Fordism are mapped in relation to precarious female workers in modern Spain. Psychogeography, Shukaitis maintains, is thus reborn as a mode of strategic planning and accumulating diverse forms of potentially resistant knowledge. Similar acts of conceptual refitting are applied in other art historical case studies as the box fills with subversive tools of strategic gamesmanship. But Shukaitis's project is further distinguished by his emphasis on using avant-garde artistic practices as a means of mobilizing labor’s autonomy within deterritorialized capitalist spaces. And this is where the drift of his research moves into high gear. In his Surrealist-inspired grafting of Italian Operaismo theory, or workerist Marxism, onto Situationist tactics Shukaitis produces an anarcho-aesthetic Chimera of sorts, a hybrid theorem that serves as a polemical rejoinder to Luc Boltanski and Eve Ciapello’s influential 2005 study The New Spirit of Capitalism. In that often-cited treatise the French sociological duo ask: why did resistance to capital became so dampened after 1968 and the onset of the neo-liberal economic program? Their reveal is this: capital has incorporated the artistic criticism of work directly into its production in such a way that labor is now not only less alienated, but, due to it’s decentralized, flexible precariousness political organizing is now nearly impossible to enact. While Shukaitis does not so much disagree with this analysis, he seeks instead to direct our attention toward another outcome. If capital has indeed sublimated art to itself, including even the most seditious experimental avant-garde theories and practices, and if capitalism now uses these methods to reinvent its surplus-value-extracting apparatus for a new age, then that also means that the subversive character of artistic labor now resides deep within the very crucible of capital’s reproductive technology. In this way Shukaitis reads the avant-garde politically, much as Harry Cleaver once read Marx’s Capital, in hopes of achieving that “reversal of perspective” (p. 3) that Mario Tronti called for over thirty-five years earlier, just as capitalist deregulation and privatization was about to go ballistic. And I am left with one question. Would such a long-overdue event constitute that ontological break Bosteels envisions carrying communism out of the shadows and into actuality? If both capital and labor now approach work as creative and flexible, rather than as the hierarchically structured drudgery of the Fordist assembly line, communists as well as speculative leftists and avant-garde strategists will depend upon the naming power of writers such as Bosteels and Shukaitis whose abstract and practical labors help us rethink resistance and oppositional institution-building in the precarious present and post-Occupy future.